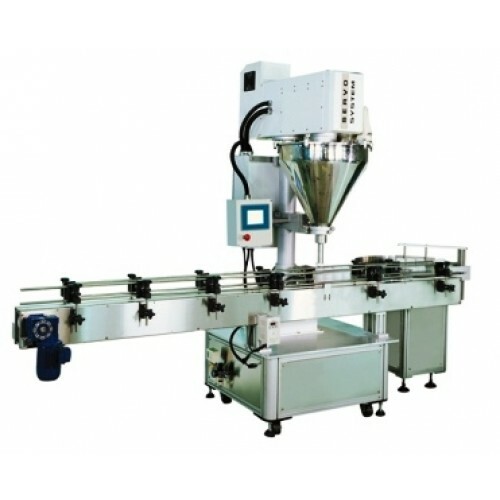 The Automatic Bottle Filling Machine, Can Filling Machine is designed for filling and metering various bottled / canned power and granular products, such as canned milk powder, medicine powder and Chinese herbs powder, food powder and chemical powder etc. Straight-feed system for filling product into bottles and cans. Automatic bottles / cans positioning and elevation and vibratory filling. No filling in case of lack of bottle. The machine stops automatically when bottle is jammed. Employ Japan SMC air cylinders. The machine does not run in case of no air supply or insufficient air pressure. The machine is available to be connected with automatic bottle feeding system or a capping (can) system.